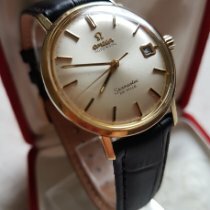 The Seamaster De Ville was part of the Omega catalog in the 1960s. Later De Ville lines all stem from this original vintage timepiece. This simple three-hand watch includes an automatic or manual movement, with or without a date display. In 1948, Omega began its first family of watches with the original Seamaster models. The Seamaster De Ville joined this family in 1959. While it looked similar to its sister models, it featured a unishell case. This means the case back was not removable and the movement could only be serviced from above. One disadvantage of this construction was its sensitivity to water. The Seamaster De Ville, for example, could only resist a maximum of 30 m (3 bar, 98 ft) of water pressure. Early on, 'Seamaster' was the only word printed on the dial. From 1962 to 1967, the inscription read 'Seamaster De Ville.' The De Ville developed into its own collection over time and the word 'Seamaster' was eventually dropped from the dial in 1967. The De Ville remains part of the Biel-based manufacturer's catalog today. 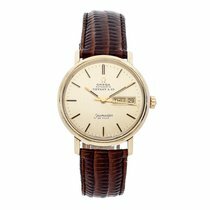 Like most watches from this period, the 34-mm Seamaster De Ville is considered small by modern standards. The case comes in stainless steel or gold, and the dial feels both elegant and tidy thanks to its thin line indices and hands. This timepiece came with or without a date display, which would sit at 3 o'clock. Omega offered these watches with manual and automatic movements. Plexiglass was used to protect the movement and dial. 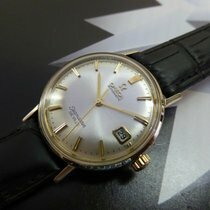 How much does a Seamaster De Ville cost? During its ten years of production, Omega released this watch in a number of different variations. The main difference between versions was the caliber used, though the dial also underwent some minor changes. Most models featured line indices to mark the hours. However, some used numerals or, like the original Seamaster, triangular indices at 3, 6, 9, and 12. Manually-wound watches from 1960 mark the entry point into this collection. A dateless, stainless steel Seamaster De Ville with the reference number 14750 starts around 790 USD pre-owned. The manual caliber 600 ticks away inside this timepiece. For a caliber 610-powered example with a date, you will need about 890 USD. You can find this watch under the reference number 14775. Automatic models are only slightly more expensive. The ref. 165.0020 lacks a date, is powered by the automatic caliber 552, and costs around 1,000 USD. 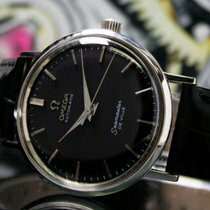 That being said, prices for an automatic Seamaster De Ville with a date display can easily climb to over 1,700 USD. One such example is the stainless steel ref. 14910, which features the caliber 562. 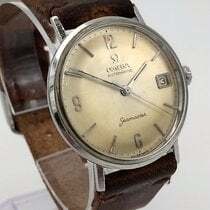 Omega first presented the Seamaster to the public in 1948. This watch was based on the design of timepieces Omega produced for the British armed forces during the Second World War. They were robust, easy to read, and, most importantly, water resistant. An entire family of watches developed from this original model, and it continues to grow to this day. This history explains how the Seamaster 300, Railmaster, Ploprof, and Bullhead belong to the same family as the Planet Ocean, Diver 300M, and Aqua Terra. The De Ville collection also has its roots in the Seamaster series. In the 60s, this watch was still called the 'Seamaster De Ville' before Omega decided to make the De Ville into an independent collection.